Aden wanted adventure. Now he only wants answers. J.A. Alexsoo was born and raised in Ontario, Canada, and has forever been a fan of fantasy. She's attained a B.Sc. in biology and environmental studies in university and graduated from college, but her education in science hasn't diminished her passion for fiction. Julie is a writer, and most recently is the author of The Knight's Order. She has also published a short story with Reader's Digest: Our Canada called A Gift Without Wrapping. When she isn't imagining new adventures for her novels, she walks her dogs and loves capturing scenes of nature. The guy with an opinion. Based off the first few chapters would have been excited to continue this story. Unfortunately after those the story goes down hill. It felt like the author wanted things to happen so they just did. There was almost no lead up to any event...it just happened. Another irritation was that character development stopped making sense. You would honestly have to read it to understand as I fail to find the words to describe it. Overall, I think if the book had received a dedicated editor this would have turned out to be a great book. Hope the author improves going forward as this is a diamond in the rough. A real page turner! The writer did an excellent job and has a talent for story telling. The book had a good pace and kept my interest till the end. I definitely recommend this book and look forward to the next instalment. 2.0 out of 5 starsA great novella padded with fluff becomes a poorly constructed novel. 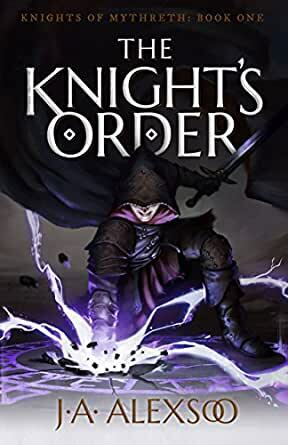 This fantasy of an unusual order of knights, who control great magic, moves right along at a happy clip until the middle of the book. Then suddenly the big battle is over, a great evil is eliminated from the world, and we should go about living happily ever after. The last half of the book contains backstory for the main characters, some of whom are already dead. We drift along being introduced to the druids who are as mystical and yet common as expected and nothing much happens beyond further backstory as we drift along to a sudden climax that seems to kill the main character, or at least remove him from the world, leaving us hanging on a cliff that appears to be between worlds. Cool set up for the next novel in the series, but disappointing, although I can not put my finger on just why? Perhaps it is because it feels like a great novella was padded with fluff to become a poorly constructed novel.